Joel Zimmerman, more commonly known as deadmau5 (pronounced 'dead mouse'), is one of the most iconic figures in electronic music. He performs wearing a mouse-shaped helmet which is often programmed to light up in sync with the music. Aside from three JUNO Award wins and six GRAMMY nominations, deadmau5 was the first electronic artist to appear on the cover of Rolling Stone magazine and performed at the 54th Annual GRAMMY Awards which marked the first time electronic music was highlighted in the telecast. 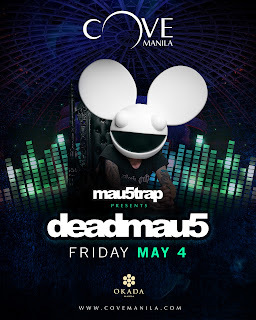 Known for his experimental style in using various genres to create his unique sound, deadmau5 has released a number of critically acclaimed albums, of which > album title goes here <, while(1<2), and W:/2016ALBUM/ have reached the #1 spot on the US Billboard Dance/Electronic albums chart. His singles have also topped international charts and reached platinum status including “Ghosts ‘n’ Stuff,” as well as “Professional Griefers,” “Sofi Needs A Ladder” and “I Remember". Be the first to see deadmau5 in Manila when he hits the Cove Manila stage on Friday, May 4, 2018. Doors open at 10:30 PM. General admission tickets start at Php 1,500++ and VIP tickets start at Php 3,000++. For table reservations and more information, visit covemanila.com, and follow the official Cove Manila Facebook page.